Dubbed by Pearl Izumi as the “purist’s dream shoe,” the E:Motion Trail N1 is an off-road running shoe built to deliver a smooth, responsive ride to go with its glove-like fit. The shoe is designed for trail running enthusiasts who prefer a maximum protection from debris in a minimal construction. The Trail N1 is part of Pearl Izumi’s Project E:Motion series, which is geared towards smooth and efficient running. Its innovative Dynamic Offset technology eliminates forefoot slap, all the while reducing shock from continuous impact. With a mere 1mm drop, the shoe is extremely low to the ground, thus offering sufficient ground contact for improved stability and just a better, more natural feel overall. Despite its 9.6-ounce weight, the Trail N1 is built for the long haul. 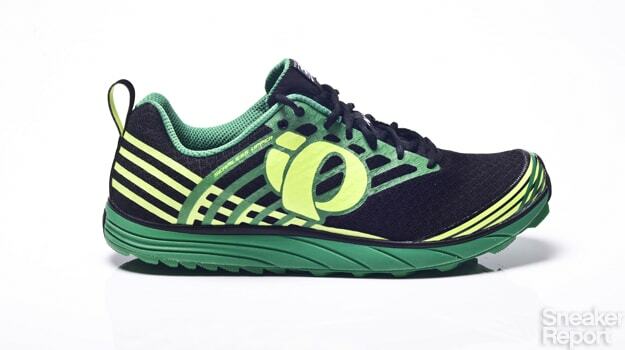 It has proven itself in long endurance races, and makes for the perfect lightweight ultra marathon shoe. Inside, the N1 features a deeply cupped heel that cradles the foot. On the outside, the shoe features a seamless upper, paired with a rubber outsole that has a unique self-cleaning lug pattern. For protection against trail hazards, the N1 comes loaded with a forefoot rock plate, as well as a bonded toe cap—both of which protect against rocks and other potential debris.